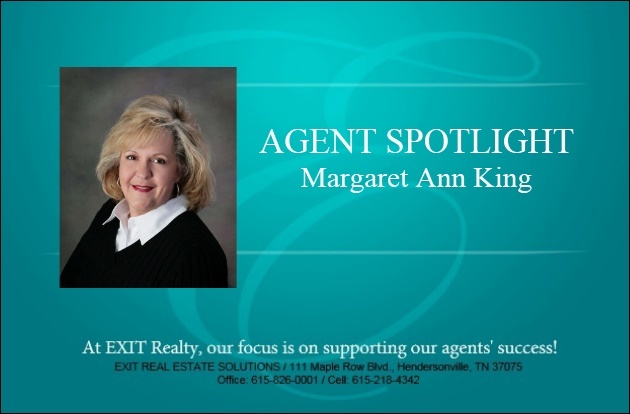 Our Agent Spotlight for this week is Margaret Ann King. Margaret Ann King currently lives in Springfield and her home is located on the Legacy Golf Course. She is the youngest of 4 children with 3 brothers. She grew up in Adairville KY and attended college at Western Kentucky University. Her favorite fur baby is a border collie named Boonie. Her hobbies include traveling, painting, and she is a member of the Methodist Church of Springfield. Margaret Ann was a sales secretary for Nasco and while working there she took real estate classes with an associate’s wife and together they passed the Real Estate exam. One day a friend came in and asked if she was going to be a sales secretary forever. That prompted Margaret Ann to get out and sell Real Estate. In her first month she wrote 5 contracts. That was 30+ years ago and she has been a multi-million dollar producer consistently since. Only 1 year has she not sold multi-million. She is licensed in TN, KY, and holds her broker’s license in both states. 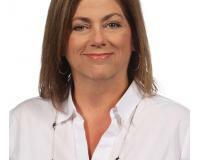 Her favorite things about Real Estate – design, development, new construction, and the promotion of selling homes. She desires to see people fulfil their dream of home ownership and appreciates the opportunity to do so. She LOVES what she does and if you ever spend time with her it shows in everything she does! When asked what she likes BEST about EXIT? The education, support, broker availability, and has made more money with EXIT than the other companies she has worked with. She loves to receive residual income! We are blessed to have Margaret Ann King in our office! Contact Margaret Ann to buy, sell, or invest Real Estate.